PRESS the TV device key. PRESS the RCVR device key. PRESS the desired device key (TV, or CABLE), then PRESS the SLEEP key once to set the built in sleep timer for 15 minutes. Note: If you assign a macro to a device key, the remote will be put into that device mode before executing the macro. You can now repeat the last two steps for any other buttons that need to be moved. When you have finished, PRESS and HOLD the SETUP button until the red LED flashes twice, then RELEASE. it would be: SETUP - 9 - 9 - 4 -TV - VOL UP - VCR- VOL UP - two blinks - hold SETUP - two blinks. If there is a botton on your original remote that is not present on your universal, or the button on the universal does not function properly, you can learn the commands from your original remote. There are four buttons specially assigned for learning (the four 'S' buttons) but you can actually learn to any button on the remote (except SLEEP). 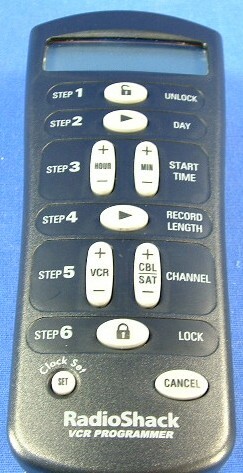 Line up your original remote and the 15-1996 head-to-head before completing the following steps. PRESS the 15-1996 button that will receive the learned function, the LED will flash radidly. Now you can repeat steps 3 through 5 to learn other functions onto other keys or press and hold SETUP until the Cinema's red light flashes twice to lock in your new feature.� (If the red light does not blink twice, stop and repeat steps� through 6). If you know that the device code you need is in the same format as an existing device code, but has a different manufacturers code coded within, you can use this process to create a new device code for your device. This process will leave the original key mapping in place, if the key mapping is not correct you will have to remap the buttons using advanced codes. ENTER the 4 digit code for the device code to be copied- two flashes. PRESS 9 - 7 - 0, the red LED will flash twice. ENTER the new manufacturers code and press SETUP, two flashes. PRESS 9 - 7 - 1, the red LED will flash twice. PRESS the device button you want to clear twice. - Two blinks. The default time that the backlight stays on for is 5 seconds, but this can be adjusted with the following procedure. Type in the number of seconds that you would like the light to stay on for. PRESS SETUP - Two blinks.